POP MUSIC: Japan’s WagakkiBand impresses with a potent, unique blend of traditional sounds and driving rock. Before even taking the stage, Japan’s eight-piece WagakkiBand had already achieved a fairly impressive feat on Tuesday night. In this age of struggling to attract sizeable audiences to pop venues, the group nearly filled the Club Bahia on Sunset – on a weeknight, no less. 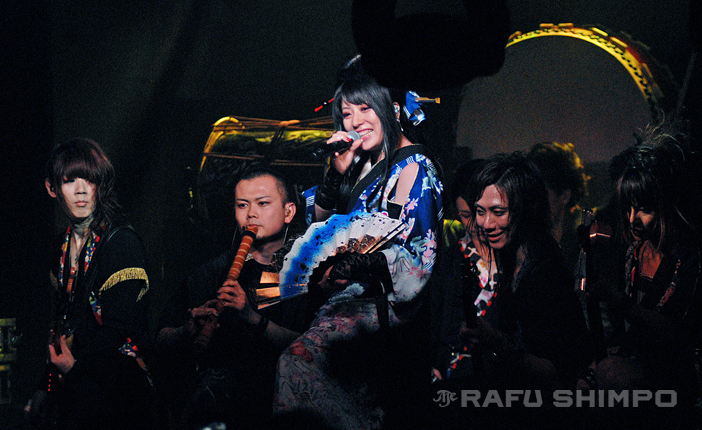 Wagakki refers the family of classic Japanese musical instruments – koto, shakuhachi, shamisen, taiko, etc. By combining these sounds with hard-driving electric guitars and drums, this band has created a seamless synthesis of traditional Japanese sounds with thoroughly modern Western rock. WagakkiBand are on a brief West Coast tour that took them to the House of Blues in San Diego last night, next a Saturday appearance at the historic Fillmore in San Francisco. In Japan, the group has also effectively combined the old and new in terms of their marketing approach, using social media and YouTube to establish a presence, then backing it up with old-fashioned, wheels-on-the-road touring. The video for their song “Tengaku” was viewed nearly a quarter of a million times in only four days after its release, and “Senbonzakura” has had more than 44 million views. The band made quite a splash at this year’s South by Southwest Music Festival in Austin, Texas. WagakkiBand played to a loyal fanbase at last year’s Anime Expo in Los Angeles, but the group has managed to attract a largely non-Japanese audience, certainly making them the salivating envy of countless pop acts in their homeland. The crowd at Club Bahia appeared to be mostly local, not ex-pats seeking comfort in the sounds of home. The band’s website, wagakkiband.jp is available in English as well as Japanese and French.